The Old Foodie: Figgy Puddings. A young man called James Letcher left his home in Cornwall and set off for the goldfields of Ballarat, Australia in 1857. Life aboard migrant ship was significantly better that that aboard the convict ships of seven decades earlier, but not as luxurious as that aboard cruise ships a hundred years later. Passengers supplemented the ship’s supplies with their own, and took turns assisiting with cooking. James wrote regularly in his journal, which was addressed to his wife and children who were to follow him later. June 6th Saturday: This day we have a good breeze gained more today than we have before since we left Liverpool, my turn to be cook today, had meat and fig puddings boiled in a bag with a plenty of suet, but I don't like the mode they have for dressing the meat here, put into a large chaldron called copper many hundreds in bags and boiled with sea water, a very pig like way to me, we have a plenty of sugar, tea and coffee and oatmeal served out every week and good many other things but there is so many passengers on board this ship that we can[t] get our meat dressed as we ought, a person that goes to sea he must be rough both in manners and appearance and eat everything that will come along for the first, I can get along very well, but I have to eat here what I should not at home, but some folks here can't eat the meat we have. Victorian men (unless they were professionals) did not normally cook, and elsewhere in the journal James notes the mild amusement of some of the women aboard ship at seeing him elbow deep in flour. It was probably good training for making damper – the fireside bread which was a staple of the bush and the goldfields. I wonder if his wife had given him a few hints before he left? Suet pudding was a Victorian staple. There was an almost infinite number of variations both sweet and savoury, and they were all hearty, stick-to-your ribs kind of fare. No need to look any further than Mrs Beeton (1861) for a version such as James might have cooked. Ingredients: 2 lbs. of figs, 1 lb. of suet, ½ lb. of flour, ½ lb. of bread crumbs, 2 eggs, milk. Mode: Cut the figs into small pieces, grate the bread finely, and chop the suet very small; mix these well together, add the flour, the eggs, which should be well beaten, and sufficient milk to form the whole into a stiff paste; butter a mould or basin, press the pudding into it very closely, tie it down with a cloth, and boil for 3 hours, or rather longer; turn it out of the mould, and serve with melted butter, wine-sauce, or cream. The other famous mid-nineteenth century cookbook was Eliza Acton’s Modern Cookery for Private Families (1845). Eliza’s book is the finer there is no doubt, and many of Mrs Beeton’s recipes are taken from it. There is no shortage of suet pudding recipes in Modern Cookery, but Eliza also gives this lovely compote made from figs – again, the dried sort of course, not the fresh. Put into an enamelled or a copper stewpan, four ounces of refined sugar, the very thin rind of a large and fresh lemon, and a pint of cold water. When the sugar is dissolved, add a pound of fine Turkey figs, and place the stewpan on a trivet above a moderate fire, or upon a stove, where they can heat and swell slowly, and be very gently stewed. When they are quite tender, add to them two glassfuls of port wine and the strained juice of a lemon; arrange them in a glass dish and serve them ocld. 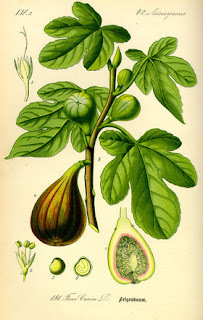 From two hours to two and a half of the gentlest stewing will generally be sufficient to render the figs fit for table. Orange-juice and rind can be used for them at pleasure, instead of the lemon; two or three bitter almonds may be boiled in the syrup to give it flavour, and any wine can be used for it, but port is best. This compôte may be served in the second course hot, in a rice-border, or cold for dessert. I tried the plum pudding last December and got some first hand experience with suet. It was quite successful. I think it may be time to graduate to the figgy variety! Hello t.w. I love dried figs. I think you might be best to wait until your winter to try it! In the meanwhile, get ready for your next Retro Cake challenge. "This compôte may be served in the second course hot." Had not realized that service à la française was still standard in middle class British homes as late as the mid-1840's. Would approach figgy pudding with care. A couple of months back I tried a very similar recipe for something called "fag pudding", which has apparently survived in central Lancashire (Burnley) as a regional dish. Don't anticipate repeating the experiment. Plum puddings. Miss Acton's Christmas pudding, which I have made with slight modification for the past 30 years (query - how large is a "wineglass-full"?) is a very light recipe and SUPERB. The Carved Angel at Tavistock clearly does substantial business every Christmas with Miss Acton's recipe and usually comes top of the league in the British newspapers' annual recommendations for "bought" xmas puds. The two styles of table service seemed to overlap for quite a few decades in the middle of the nineteenth century. Mrs Beeton (1861) gives menus for both styles. I guess the traditionalists did not want to let go of the 'a la francaise' custom. I dont think there was a standard wine-glass measure - perhaps around 5 fluid ounces? I havent made Eliza Acton's pudding, but with your recommendation I'll give it a try next Christmas. I make two changes to Miss Acton's pudding. Because suet is difficult to find down South, I substituted a slightly lesser quantity of unsalted butter, cut, cold, into the flour & breadcrumbs in a food processor at the start of the recipe. As the Carved Angel describes their recipe as vegetarian, I assume that they do the same. I have since used suet & personally prefer butter. Also I add about a heaped teaspoon (just a mid-Victorian teaspoon, not US measure) of powdered ginger. I have reservations about monkeying around with Miss Acton, but it certainly doesn't hurt the recipe. Thanks for advice on wineglass. That's about the measure I usually end up with - and it works - but so many early Victorian glasses seem to be smaller than that.